Vision and Medical Insurance: We are credentialed with and ready to accept these vision insurances: VSP, Humana- VCP, Eyemed, Superior Vision, Avesis, Spectera. We also accept these medical insurances: BCBS, United Healthcare, Medicare, Aetna, Cigna, Coventry. 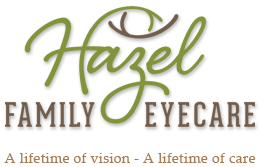 You can now request appointments by emailing info@hazeleyecare.com or request an appointment online. We accept al major Vision and Medical Insurance.